"Mixpanel is a mobile and web-based analytics platform that allows users to ask more of their data without needing to write SQL queries. " 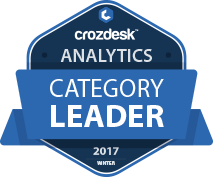 Mixpanel scored 88/100 in the Analytics category. This is based on user satisfaction (84/100), press buzz (62/100), recent user trends (rising), and other relevant information on Mixpanel gathered from around the web. Product recommendations, vendor rankings, market overview and tips on how to select Analytics software for business. Published in April 2019. 4.21/5 based on 255 user ratings. What do you like about Mixpanel? Mixpanel allows me to answer all questions about my users' behavior for my leadership team. At a small startup where the UI is constantly changing, mixpanel has made it easy to track the success of each new feature without a lot of api/database overhead. We have also integrated mixpanel into our a/b testing framework (it provides a nice UI for the data visualization) and use it every day for standard user behavior monitoring. Love that we can do filters for differnt timeframes now. What do you dislike about Mixpanel? Mixpanel's distict_id concept seemed backwards at first and took our team a little while to wrap our heads around. Differences between your core DB and mixpanel numbers can be troublesome, make sure you send in lots of data so you can segment properly and explain these. I also don't like that data is fully immutable, would like to be able to delete easier. What have you been using it for and what problems did Mixpanel solve? Unless you're explicitly sending events, chances are the data in your core DBs will lack some behavioral actions (ex. starting flows without finishing). We use it to undersatnd the actions our users take that aren't stored in our core DB. We've also used it for email campaigns in the past.